Bodybuilding is a rough endeavor to undertake. Lifting heavy weight and growing your muscle is no simple task. It requires you to follow a strict diet, hit the gym every day, and be diligent about almost every physical and dietary choice you make. Make no one forces a person to build muscle, to follow a plan, to look to become superior than just some average Joe on the street. It’s a choice one makes in order to improve and become the best version of themselves that they can be. Despite that, there is a cause and effect for every action one takes in life and it’s unlikely that you can do any kind of athletic endeavor and walk away without some kind of lasting negative reminder of all the hours you put into training your body. A bodybuilder, especially a professional, can push their body only so far before they start experiencing diminishing returns. Not everyone is Dexter Jackson and can perform at a high level into their late forties. Genetics really do make a major difference in how long a bodybuilder can keep a massive and shredded physique. For the rest of us mortals we have to take a back seat and realize it’s impossible to have every one of your engines firing on all cylinders forever. At least that’s what conventional wisdom will tell us. For retired professional bodybuilder Markus Ruhl, that may sound like nothing more than an excuse. The German powerhouse was known for his massive size in his competitive days and had a physique that was completely unreal. 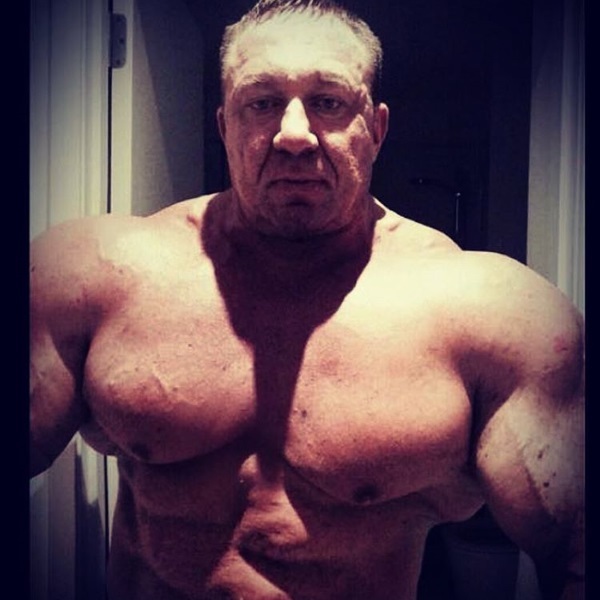 While the 44 year old may not be in the same shredded condition as he was in his heyday, Ruhl has still managed to maintain a tremendous amount of muscle on his frame as a recent Instagram posting will clearly attest.